MFMA is the authoritative source of innovative technical information for maple and sports flooring systems. MFMA establishes product quality, Performance & Uniformity Rating (PUR) standards, installation guidelines, maintenance issues and promotes the use of maple flooring products worldwide. 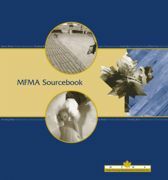 MFMA has combined all of its information in one place, the MFMA Sourcebook. Request a free copy at mfma@maplefloor.org. Surface America's ElastoFloor™ Roll-Pour is a poured urethane layer over a prefabricated and fully adhered rubber basemat, resulting in a super-durable and very comfortable surface. It's mercury- and lead-free. Ideal for basketball, volleyball, tennis, jogging and other sport and recreational usage. The shock- and sound-absorbing underlayments enhance performance and reduce fatigue. It's so durable it can easily convert from a sports surface to hold non-sport events like meetings, church services and dances. The Alaska Airlines Center is a first-class sports and entertainment facility on the campus of the University of Alaska Anchorage. Covermaster worked with contractors from the earliest stages of design and construction to find the best gym floor protection. The multi-use sports and entertainment facility is designed to host athletic events, concerts, private and public community functions. Several events, including foot-stomping concerts, have already put the gym floor cover to the test. Bring the outdoors in with Gerflor's Taraflex® and its new, modern neutral colors and more than seven dynamic wood designs. This trusted product offers superior resistance to furniture and rolling loads found in multi-use gymnasiums, while providing great sports properties to athletes when considering shock absorption and comfort. Helps prevent long-term injuries for athletes. Taraflex exceeds the AS™ F2772 standard for sports flooring and is FloorScore™ certified. Action Floor Systems offers Action Herculan® TC Pro Indoor/Outdoor tennis court systems, providing true ball bounce for all playing skills, ranging from professional to recreational. Featuring a high-performance, seamless, non-porous surface that is hygienic and easy to clean, Herculan TC Pro systems offer superior wear resistance and easy maintenance. By providing excellent ball pace and slip and sliding properties, the Action Herculan TC Pro tennis court system creates a perfect surface on which to play and is available in a wide range of colors. SnapSports® TuffShield Maple Athletic Surfacing is a revolutionary new high-performance modular sports surface that delivers the look and feel of a suspended hardwood maple floor without the high maintenance and cost. Light and Dark finishes allow for endless designs modeled from the best collegiate and professional courts. Available with SnapSports patented ShockTower® technology: the industry's only absorbent sub-structure allowing your athletes to play better, faster, longer. Junckers Hardwood Sports Flooring recently supplied another head-turning sports floor; a "Hot Salsa" color at the new Fitness SF in San Francisco. This strikingly bold color is one of dozens available in Junckers' range of solid hardwood sports flooring. All Junckers sports systems are tested to the strict standards of DIN and EN for the highest level of performance and safety. Being prefinished, installations are always quick and clean, usually a third of the time as other solid woods sports flooring systems. Dinoflex NEXT STEP™ High Impact tiles are the latest innovative addition to Dinoflex's expertly engineered line of recycled rubber sport flooring products. The dual-layer product provides long-lasting, high-color design with superior durability and added impact resistance at a more cost-effective price. Custom logo designs are created right at the factory. 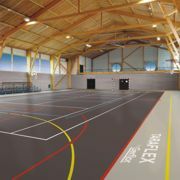 Choose Dinoflex High Impact tiles, Sport Mat flooring or Stride Fitness tiles to create the perfect flooring combination for your sports facility.